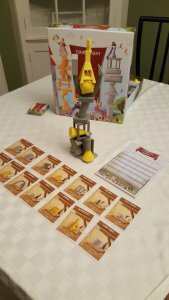 Tournament of Towers is a dexterity game from Iron Hippo Games where players try to draft the best pieces using cards to create the highest scoring tower. Players have the role to build the greatest monument for the kingdom of Geometria. This game was originally funded on Kickstarter and is now available for retail. The game is for players age five and up and can play two to four players. Tournament of Towers incorporates a drafting component into the dexterity and strategy of building your tower. Additionally, there are multiple rule variants. The game plays in two rounds. The game begins by distributing a foundation piece and Architect figure to each player. In each round, you start by shuffling the building material cards and dealing seven cards to each player. Players then draft the cards. To do this each player chooses one card from their hand and places it face-down in front of them. Then they pass their remaining hand to the person on their left. Again, they choose a card from their new hand and pass the remaining cards to the left. Drafting continues until all cards have been used. Next, each player designates their building order. This is done by placing their cards in a row, and the building order is read left to right. Then, there is the option to roll an event. Depending on the round different events occur such as changing the order of your Building material cards or moving a piece from the player to your right and add it to your tower. 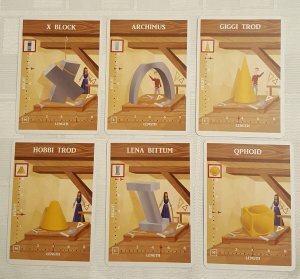 Once all players finalize their building material cards, they gather the pieces shown on their cards and build their towers in the order of the building cards. Players have the option to add their Architect figure to the top of their tower to gain an additional point. Players call out “Done” when their tower is complete. Which ends the round for them. If the tower falls between rounds it is considered a Mulligan and can be rebuilt. A Mulligan is where a player is permitted to fix their tower by placing the pieces in approximately the same places they were before it falls. To scale down the challenge level deal out fewer cards which result in placing fewer pieces. The recommendation is to only deal four or five cards and add an extra mulligan. Family Style tower building becomes a cooperative game. Players construct until the collectively decide the tower is complete and a masterpiece worthy of the King and Queen of Geometria or until the tower falls. Players begin by shuffling the whole deck. On their turn, a player draws to cards and decides which one to play. The piece placed corresponds to that card. The selected card is placed in the discard pile and the unused card is placed at the bottom of the deck. Using a single foundation piece the player or players are challenged to create a tower using all the pieces of the game. In this variant, players may use one Mulligan per round to fix their tower if a piece falls. Players place each piece of their tower one at a time in turn. For example, each player individually places their third piece, and unlike in other modes of play, the turns are not done simultaneously. The beauty of Tournament of Towers as a family game is its flexibility and how easy it is to learn. It took the family only a few minutes to learn the game and start playing. The ease of learning makes is a game that is perfect for a family party. The rules can be scaled to the skill level of the players. The rules recommend that that novice players use fewer cards per round and add Mulligans. Children as young as 5 can certainly access and enjoy this game, but the children I played with struggled to complete a tower after the first round when we played standard rules. Later we played by the simplified rules by playing fewer cards per round. The game became much more accessible and less frustrating for the kids. As we were getting to know the balance features of each of the pieces there were also unlimited Mulligans. For anyone looking for some STEM activities for their children Tournament of Towers incorporates engineering. The Ultimate Tower challenge is a perfect example of a STEM task when there is an end goal and components and the player problem solve and work through how to balance all the pieces. Tournament of Towers is a unique game with wonderful components. The pieces of this game provide such a range of open ended opportunities. It is accessible for a huge range of players. The rules are so simple and the gamplay so quick making it a great fit to family gatherings and game nights.